« I’m black, therefore my kids are, right? 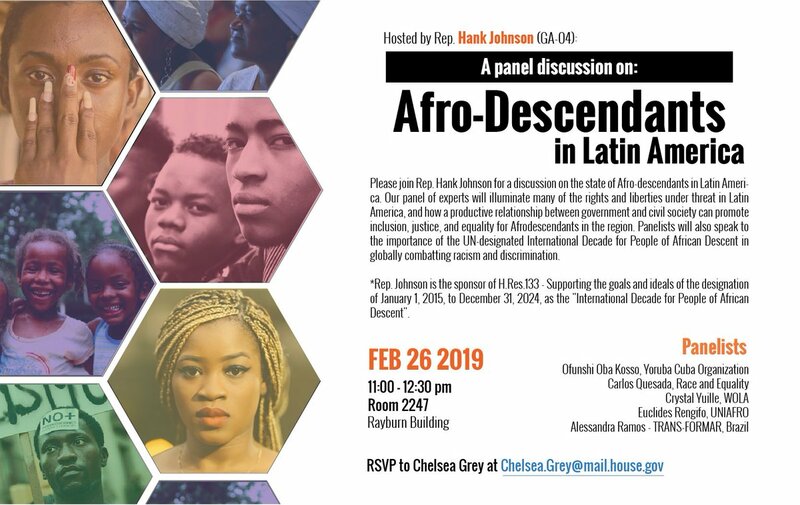 Please join Rep. Hank Johnson* for a discussion on the state of Afro-descendants in Latin America. Our panel of experts will illuminate many of the rights and liberties under threat in Latin America, and how a productive relationship between government and civil society can promote inclusion, justice, and equality for Afrodescendants in the region. Panelists will also speak to the importance of the UN designated International Decade for People of African Descent in globally combatting racism and discrimination. RSVP to Chelsea Grey at Chelsea.Grey@mail.house.gov. This entry was posted	on Thursday, February 21st, 2019 at 02:10Z	and is filed under Caribbean/Latin America, Live Events, Media Archive, United States. You can follow any responses to this entry through the RSS 2.0 feed. Both comments and pings are currently closed.